Being a coffee enthusiast, I have always loved drip coffeemakers over the other types of coffee makers in the market. Personally, I have owned several of them and I must say that they offer varying performance. As a coffee enthusiast, you will have to get the brewer and this is where most people go wrong. Actually, 3 out of 5 people got duped when buying their first coffee brewer. With this in mind, we decided to make shopping easier for you by reviewing the best brewers in the market. In this review, we first came up with a shortlist of over 20 brewers. Thereafter, we narrowed to the best 10 and tested them so as to have a first-hand experience of their performance. That said, it is safe to affirm that whatever our opinion will be, it is informed. So, without further ado, let’s go straight to the review of the best drip coffeemakers in the market. 15.1 Why Choose a Drip Coffeemaker? There is a very wrong notion about coffee brewers as most people think that you need a lot of money to get a reliable brewer. This is very wrong as there are many cheap coffee brewers that you can get at less than $100. In this segment, we have reviewed some of the best options you can go for when buying a coffee brewer on a tight budget. The PerfecTemp DCC-3200 is a superb coffee brewer from Cuisinart that I really enjoyed using. What I liked about this coffeemaker, and perhaps what makes it feature in this review is the large capacity brewing and the program feature. It also comes with Auto shutoff, small batch setting, and brew strength control. The Cuisinart DCC-3200 has been built in a simple and stylish design that I really loved especially when it comes to how it blends well with other kitchen appliances courtesy of the chrome finish. It features a small footprint that allows it to fit on your counter easily. This makes it perfect for those who have less counter space. The front interface has an LCD and 5 control buttons that took me quite some time to fully comprehend how they are to be used. However, with the display, the operation is very easy and accurate. Cuisinart included a large capacity 14-cup carafe and an equally large water reservoir with a clear window to allow users see the amount of water remaining. If you don’t want to prepare the entire full pot, there’s a 1-4 cups setting so you won’t have to do all the 14 cups especially when it is not necessary. The carafe is not thermal so you shouldn’t expect your coffee to stay very hot for long as is with thermal carafe coffee machines. Regarding performance, the Cuisinart DCC-3200 was able to brew one of the best and hot coffee cups I’ve ever tasted. In addition to this, it can brew coffee to your preference; whether regular or bold. You only need to select your type on the brew strength control panel. Cuisinart built it with a high-performance heater that heats water to very high temperature which is fundamental in extraction.The only problem is that it is not consistent. At times it starts brewing when the water is not hot enough producing some average coffee. The drip system, on the other hand, showers the beans with the hot water evenly to boost extraction. To give you the freedom you need, you can choose to use the permanent Gold-Tone Coffee Filter and a removable Charcoal Water Filter. Personally, I found the Gold Tone filter to be the best because it produced a more smooth coffee. Being the lazy coffee enthusiast, I found the 24 hours programmable feature very convenient. Before going to bed, I preset it to start preparing my coffee so immediately I was out of bed, my coffee was ready. Other features include a 4 hour Auto shutoff feature, 3 years warranty. 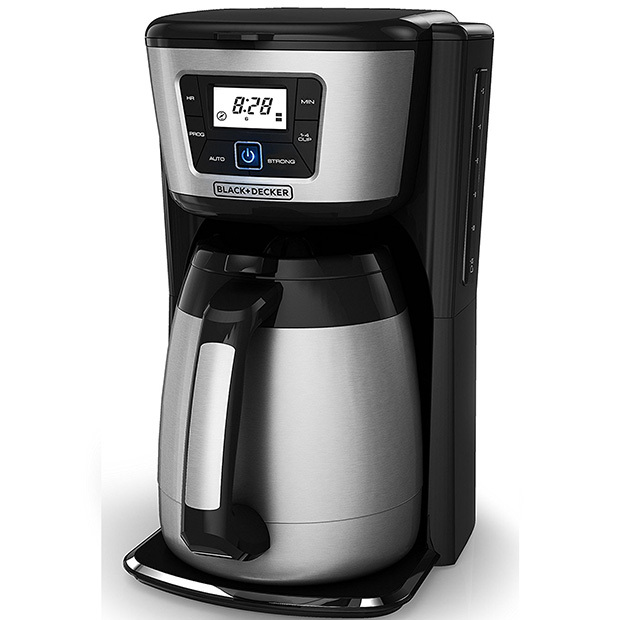 If you want a coffee maker for the whole family, then the Cuisinart PerfecTemp DCC-3200 will be a great purchase. It is programmable and has brew strength control among many other cool features. However, if you take your coffee back to back, it won’t be the best because it doesn’t have a thermal carafe. Our Rating; All factors considered, this brewer scores 4.85 stars out of 5! Chlorinated water and coffee don’t tag along well and that’s why the Mr. Coffee PSTX9 Optimal Brew is here for you. I liked this coffee brewer because it delivered full flavor and original tasting coffee with not foreign taste or smell even after using overly chlorinated and salty water. Besides the faster coffee preparation, the Mr. Coffee PSTX9 allows you to grab a quick cup of coffee before the brewing is complete. Even though controls are quite complicated, this coffeemaker is still a great purchase for those living in areas with salt and chlorinated water courtesy of the in-built water filtration filter. 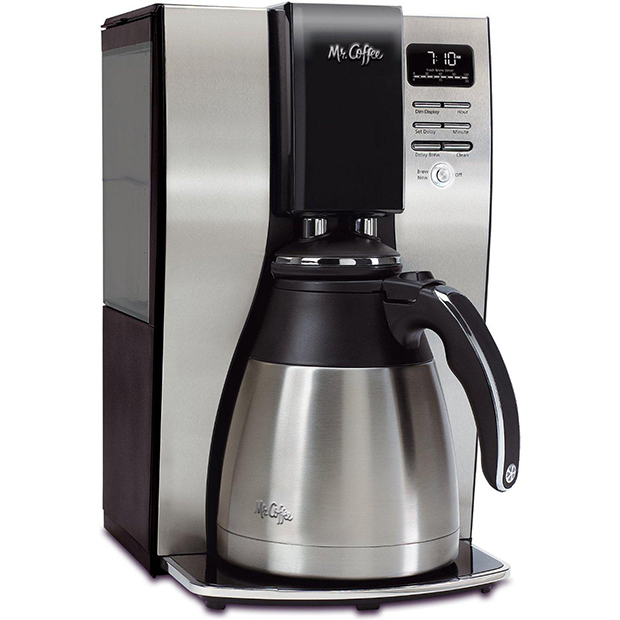 The Mr. Coffee PSTX9 OptimalBrew is a sleek and stylish drip coffeemaker that has a sleek and stylish design finished in a matte black color and stainless steel. It comes with a 10 cup thermal carafe that still kept my coffee hot 2 hours after I had brewed it. However, there are several concerns about the effectiveness after three or four months of use. For easy handling and to prevent slipping, this carafe has an ergonomic handle for a tight and non-slip grip. One thing I didn’t like about the carafe is that the nozzle design pours coffee slowly. Also, coffee leaks on the counter when the carafe is removed. Even though the water reservoir doesn’t give you a view of the water levels, it is detachable and thus, very easy to refill and clean. For me, I tend to forget things very fast and the Auto shutoff proved to be a great feature that helps in saving energy. Once the filters and other components required cleaning, the Self Clean notification promptly reminded me to do so. There’s also an LCD display and a digital control panel for easy control. Besides, it displays how fresh the brewed coffee is by showing the time elapsed since it was brewed. 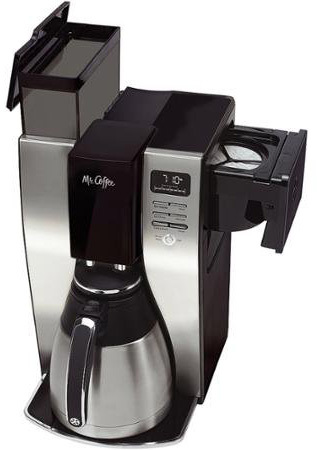 Like earlier mentioned, the Mr. Coffee PSTX9 OptimalBrew will prepare a great cup of coffee with natural tasting flavors and aroma even if you are using overly chlorinated or salty water. There is a built-in water filter that removes up to 97% of chlorine form water. The high-performance heater heated the water to an impressive 195° to 205° F; temperatures that the Specialty Coffee Association of America (SCAA) have confirmed to be best for brewing. Mr. Coffee built this coffeemaker with a Gold Tone Permanent Filter to ensure smooth coffee but I had a problem with it because I’ve tasted a more smooth coffee cup that what it had to offer. In less than 6 minutes, it will have brewed 10 cups of hot, crispy and smooth coffee. Another great feature I liked is its programmability. The Delay Timer allows you to plan your day by presetting the time when it should start brewing your coffee thus saving the time you’d have otherwise fumbled your way to prepare it. Instead, you will be quickly jumping out of bed to grab a cup of coffee and not worrying about how long it will take for it to be ready. For those who are impatient like me, the Pause N’ Serve feature will be of great help to them as you can quickly grab a cup even before the brewing is complete. If your water is overly chlorinated or you live in areas with salty water, the Mr. Coffee PSTX9 OptimalBrew will be a great purchase for you. It has an inbuilt water filter and it prepares authentic tasting coffee with full flavors and aroma. Our Rating; All factors considered, this brewer scores 4.8 stars out of 5! If there are times you only long for a single cup while other times you take several cups, then the Hamilton Beach 49980A will be a great purchase for you. I really liked the two-way functionality of a single serve coffeemaker as well as the 12-cup full pot brewing. Besides this, Hamilton Beach included an LCD and a programmable clock and timer for your convenience. Depending on your taste, you can also choose the strength of your coffee. Unlike the Bonavita BV1900TS that we’ll review later on, Hamilton Beach focused a lot on aesthetics. It has a simple yet elegant design with a small footprint to allow it fit in tight countertop spaces. It has a 12-cup glass carafe and a water reservoir beside it. The front panel has a very easy to use control panel with LCD. There are 4 buttons; hour, minute, brew options and program. The 24 hours programmable feature is of importance in this coffeemaker. I preset it to start brewing coffee at 7:00 am and it did so without any further prompting. There’s also an Auto shutoff feature that is activated after 2 hours of idling. Remember, this machine doesn’t have a thermal carafe. Instead, there is a non-stick keep warm plate. This plate kept coffee hot for just less than an hour which is a very short time considering thermal carafes can keep coffee hot for over 2 hours. In terms of performance, the Hamilton Beach 49980A can be used to brew single servings as well as full pots of up to 12 cups. It is this versatility that makes it among the best drip coffeemakers in the market. Besides, we also noted a coffee strength selector that lets you brew coffee of different strengths (regular or bold) depending on your preference. Besides ground coffee, this coffee machine can use soft pod coffee and still produce the best and naturally flavored coffee. These soft pods are snapped on the provided pod holder for maximum extraction. There’s also the Pause & Serve function that lets you pause brewing and serve a cup if you are in a hurry or you want to taste the strength. The Hamilton Beach 49980A is a very versatile coffeemaker that lets you prepare single serve as well as full pot coffee. Besides, it is 24 hours programmable, a feature that most similar drip coffeemakers lack. In as much as its carafe is not thermal, it is still a great bargain! What I liked about this coffee brewer is the convenience it offers courtesy of the Dash Button for easy and instant Amazon shopping. 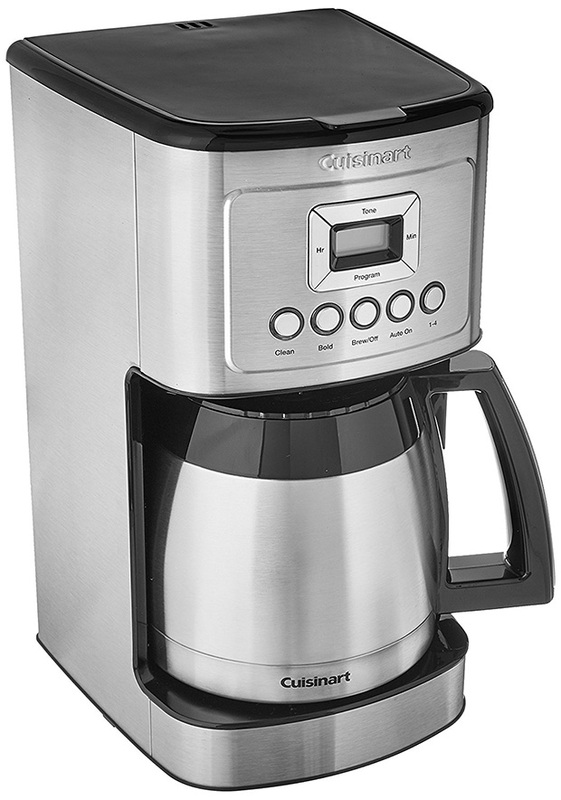 Besides this, the Cuisinart PerfecTemp DCC-3200 has a large 14-cup carafe making it a great choice for those looking for a coffee brewer for offices or a large family of coffee enthusiasts. With this coffee brewer, I was able to prepare both bold and regular coffee depending on how I want to be caffeinated. In case you are worried about defects or malfunctions, Cuisinart offers a 3-year warranty. This bundle comes with a coffee brewer and a Folgers Dash Button. It is the Dash Button that makes this bundle something worth checking out. In case you are wondering what it is, the Dash Button is a small device that has Wi-Fi capabilities to connect to your Amazon App to order items you have already preselected. What I liked most about this offer is the free $4.99 instant credit that you get on your second press. This has a compact design that will easily fit in your pocket. Besides, the device is very easy to use and will order all the items you have put in your cart instantly; you don’t have to go through the entire process. There’s also Order Protection that lets all your Amazon shopping activity private. The Cuisinart boasts a 14-cup brewing capacity that makes it great for those looking for a family coffee maker or offices. What put me off is that the carafe is not thermal; instead, it has a hot plate that makes coffee bitter at times. Even though it is not SCAA certified, it brews coffee at the perfect temperatures and the hot plate allows it to remain hot for an hour or so. Besides, there’s brew strength control to help you brew regular and bold coffee depending on your preference. If you want value for money, this bundle will be awesome for you. It comes with a reliable coffeemaker that brews hot and highly flavored coffee. If you hate going through the entire ordering process, then the Folgers Dash Button will come in handy. You also get free credit worth $4.99 after your first order with the Dash Button. The BLACK & DECKER CM2035B had to feature in this list of the best drip coffeemakers not because it’s from a top brand only; it also offers great performance when it comes to brewing the best coffee -whether regular or bold. With a freshness counter and program feature, it is a great coffeemaker considering the less than $100 price tag. However, in as much as it has a thermal carafe, most verified reviews suggest otherwise when it comes to keeping coffee hot. Besides, the carafe lid’s mechanism is not durable. As is the norm with BLACK & DECKER, this coffee machine has a small footprint and a stylish design with black and chrome finishing. With a 12-cup carafe, you can prepare coffee for the whole family and even friends. The carafe is thermal so your coffee will stay hot for a very long time. However, there are numerous claims that after long use, it is not very effective and will keep coffee hot for 30-45 minutes after. I also expected it to have a small batch setting to prepare little coffee and it never disappointed. It has a 1-4 cup brewing setting that allowed brewing of small amounts of coffee. The carafe has a wide mouth opening that makes refilling, cleaning and pouring very easy. There’s also the unique No-Drip Perfect Pour Spout feature that ensures there are no spills when the carafe is removed. However, this lid is faulty in most units and stops working after some time. The interface has an LCD and easy buttons that I got used to on the first day. There’s also the QuickTouch Programming that I used to preset the brewing time; a feature that really saves time and helps to plan the day ahead. The BLACK & DECKER CM2035B boasts a highly efficient water heater that heats water to 197 – 205 degrees Fahrenheit – the perfect brewing temperature range. However, I noticed that it is very inconsistent and this is evident from the varying coffee quality. All in all, the EvenStream drip technology covers for this. It evenly distributes the hot water on the ground coffee for maximum extraction without losing any flavors. Depending on the type of coffee you like, you can choose the coffee strength with the help of the brew strength selector on the control panel. One amazing feature of this coffeemaker is the freshness counter that displays the elapsed time since the coffee was brewed. There’s also a unique feature; Sneak-a-Cup that allows you to get some coffee before it completes brewing. The BLACK & DECKER CM2035B can be a great coffeemaker for those looking for a large capacity coffee machine. Besides, it can brew small amounts of coffee. 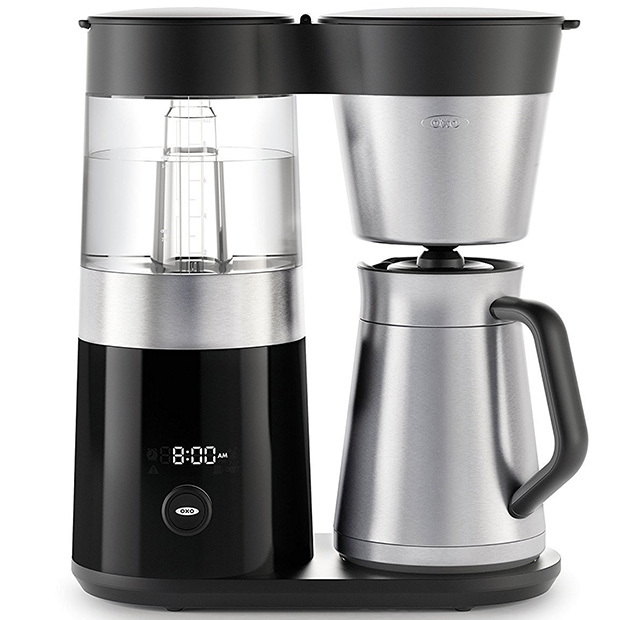 Equipped with several unique features like freshness counter, programmability, Sneak-a-Cup, and a 2-year warranty, it is a great coffee maker with a thermal carafe. However, don’t count on it so much in keeping coffee hot after 3 or 4 months of use. Our Rating; All factors considered, this brewer scores 4.83 stars out of 5! The GRB Velocity from BUNN also had to feature in this review of the best drip coffee makers. What I liked about this coffee brewer is how fast and efficient it is. It only took about 3 minutes to prepare 4 cups of naturally flavored coffee. With a 10 cup capacity and an insulated thermal carafe, you can enjoy hot coffee hours after brewing it. It has been engineered for heavy use and will suit those who prepare lots of coffee on a daily basis. 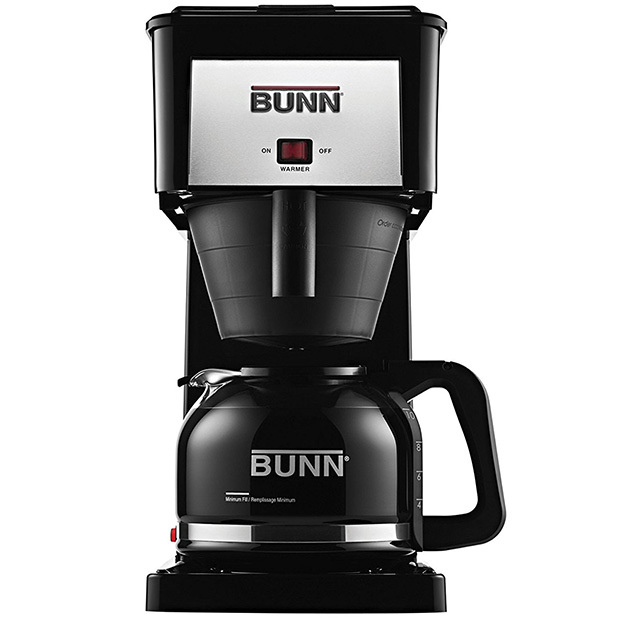 The BUNN GRB Velocity has a strong commercial grade build even though it is just a domestic coffee brewer for homes and offices. What sets it apart from commercial brewers is the small footprint that allows it to be fitted on counters with small spaces or even in offices. Unlike those fancy coffee brewers that have sophisticated control features like several buttons and even LCDs, the GRB Velocity has only one on/off button with an LED indicator. BUNN included a stainless steel water tank with an internal thermostat that keeps water hot for on-demand coffee preparation. Besides, the 10 cup carafe is thermal and has been double insulated to ensure your coffee remains hot for longer. Of all the coffeemakers we tested in this review, BUNN GRB Velocity scored highly when it comes to coffee heat retention. This is because the thermal carafe is backed by a porcelain-coated warming plate to ensure no heat is lost. One thing most BUNN GRB Velocity owners don’t know is that there is a number you can call to get a free “flow restrictor” piece to replace the spray head in the event it fails. With regards to performance, the BUNN GRB Velocity has been engineered with a high-performance and efficient 800W heater that quickly heats the water in readiness for extraction. Immediately I switched it on, I could feel the heat but again, this efficiency tends to fade with time. On the downside, on long use like a hour of continuous brewing, it emits a lot of heat that tends to produce a foul burning plastic smell. Worse enough is when you taste the burning plastic in the coffee. The multistream Sprayhead, on the other hand, distributed the hot water on the coffee beans evenly guaranteeing deep extraction. The large flat-bottomed filter and funnel also ensure that the hot water reaches every coffee bean for maximum saturation. The end result was a rich and great tasting full flavor cup of coffee that kept me caffeinated for an unusually long time. If you hate counter messes like me, this drip coffeemaker will be the best for you. It has a drip-free carafe with an exclusive lid and spout design that ensures coffee goes where it’s supposed to and not on the counter. 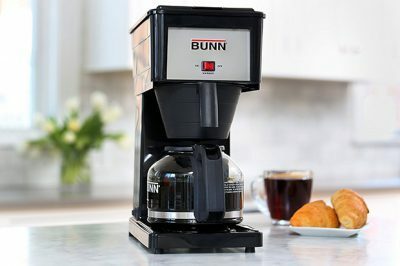 The BUNN GRB Velocity has been engineered for heavy use and this makes it best for offices or homes with many coffee enthusiasts. Even though there are cases of a burning plastic smell and the heater wears out fast, it is a great coffee brewer considering the price! If you want something more robust and advanced, you need a budget of $100 – $200. Here, you are guaranteed reliability, durability and some few extras. Having said that, here are some of the best brewers you can get within the budget of $100 to $200. 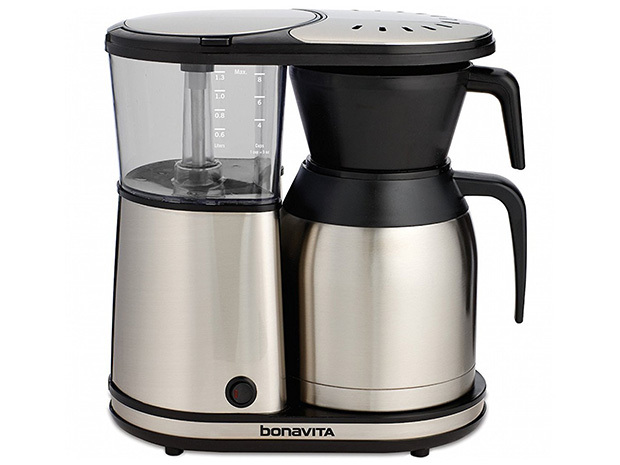 Having used the Bonavita BV1900TS for over 8 months, I must say that it is a great coffee machine that is worth checking out especially if you are on a budget. It is SCAA certified and brews the best and fully flavored coffee courtesy of the enhanced saturation and better extraction. Its main materials are stainless steel and BPA-free plastic that won’t change the natural taste of coffee. With a very small footprint, the Bonavita BV1900TS will fit on any countertop regardless of how small it is. This coffeemaker is not as good looking as most of the coffeemakers we know of. It doesn’t have a flashy control panel, LCD or even LED indicators. In fact, there’s only one button on its interface; on and off. 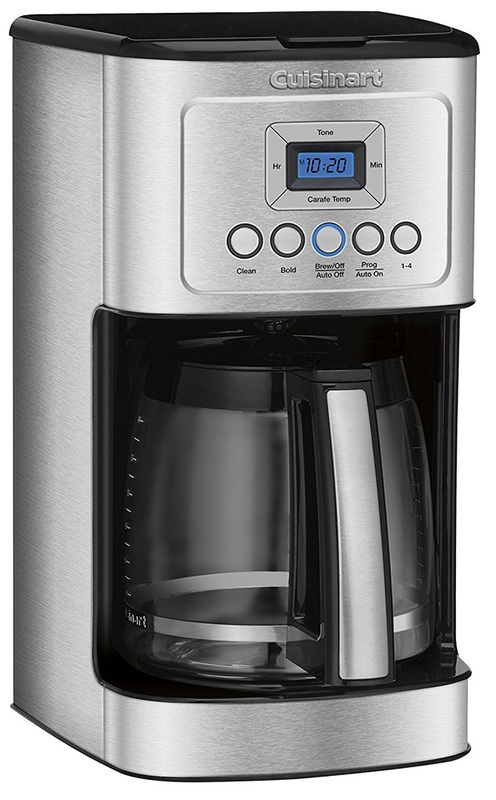 The stainless steel finish and black plastic accents give it a more traditional drip coffeemaker look. With a thermal insulated stainless steel carafe, you can brew several cups and drink them while still hot. If you are the type that does two or three cups in the morning, this will be a great machine for you. The Bonavita BV1900TS is equipped with a powerful 1,500W heater that delivers water temperature of around 195 -205 degrees Fahrenheit; the perfect temperature for brewing coffee. This makes it among the few SCAA certified coffeemakers out there. However, this heater is not energy efficient and will cost you a few more bucks on your average energy bill. There’s a wide showerhead that evenly distributed the hot water for the best extraction. Thereafter, even saturation is made possible courtesy of the flat-bottomed filter basket and the result was splendid; hot flavored and rich tasting coffee. Unfortunately, with this machine, I couldn’t program it to brew my coffee every morning and that’s why I had to do away with it. Even though it doesn’t have an appealing design compared to the likes of the Cuisinart DCC-3200 or the Mr. Coffee OptimalBrew, the Bonavita BV1900TS is still a force to reckon when it comes to its coffee brewing performance. If you only care about coffee quality, then add it to your wish list. 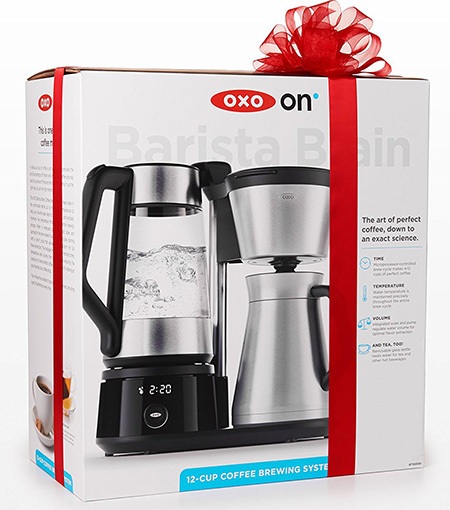 The OXO On Barista Brain is very easy to use and offers an exceptional coffee brewing experience. With an SCAA certification, it is very simple to use and doesn’t require you to be a pro like a barista to prepare good coffee. What impressed us in this coffee machine is the 3-stage approach that focuses on time, temperature and volume – important aspects that determine the quality of the brewed coffee. Besides, you can choose the amount of coffee you want to brew; from 1 cup to 9 cups. The OXO On Barista Brain sports a sleek design with an attractive finish. It comes with a clear water reservoir and an insulated stainless steel thermal carafe that will keep coffee hot for up to 2 hours. There is also an LCD that helps in making precise adjustments and showing how fresh the coffee is. For easy handling, OXO crafted the carafe with an easy, nonslip handle for better ergonomics when pouring and cleaning. Unfortunately, this machine can’t be programmed for several days. However, it comes with a convenient Wake-up timer that can be set for a maximum of 24 hours. Even though it has a 9-cup capacity, it can still serve as a single-serve coffeemaker. I was able to brew 1 cup and even 9 cups. You only need to specify the amount you want to brew using the simple single dial. The OXO On Barista Brain has an Intelligent microprocessor dubbed ‘Barista Brain’ that ensures the water is poured on the coffee beans in precisely timed cycles to ensure optimal extraction. Being SCAA Certified, it heats water to 197.6 and 204.8 degrees Fahrenheit which is the best temperature range for coffee brewing. The precise temperature control will help you maintain optimal temperatures that coffee best brews in. The water pump cycles are also automatically adjusted depending on the amount of coffee you are preparing. This is further enhanced by the Rainwater ShowerHead hole pattern that evenly sprinkles water on the coffee beans for the best extraction. One unique feature is the carafe mixing tube that helps to mix the overly-extracted beans and the under-extracted beans for a smooth cup of coffee. If you are green when it comes to coffee brewing, then this is your perfect match. It is very easy to use compared to other coffee brewers and delivers rich tasting and highly flavored coffee. Our Rating; All factors considered, this brewer scores 4.92 stars out of 5! What caught my eye in the Capresso CoffeeTeam GS is the grinder function that allowed me to use fresh coffee beans for fresh and great tasting coffee. Besides this, it packs several other convenience features that make coffee brewing an easy task. These features include an LCD, program function, Auto shutoff, among others. The only downside of this coffee machine is that the carafe is not thermal. The Capresso CoffeeTeam GS has been finished in black and stainless steel accents that enable it to blend with the rest of your kitchen appliances. It has been equipped with a 10 cup carafe to allow you make enough coffee for everyone. For me, I am a loner so there’s no time I had to brew 10 cups. What I had to do is use the small batch setting to choose the amount of coffee I wanted. You can choose to brew 2, 4, 6, 8 or 10 cups depending on your needs. On the downside, the glass carafe is not thermal. Instead, there is a non stick hot plate for keeping the coffee hot. Unlike those coffee machines that had leaks when you remove the carafe, I noticed there was a drip stop feature that ensured no coffee dripped when I removed the carafe. You can also program this machine to start brewing at your preferred times to save time. There’s also an LCD with an intuitive control panel, two-hour auto shut off, Pause & Serve, among many other features. As earlier mentioned, the Capresso CoffeeTeam GS has 2-in-1 functionality that lets you grind and brew coffee with the same machine. I liked this feature because it allowed me to prepare fresh coffee with fresh coffee beans. If you don’t like a coffeemaker with grinder because of the large size, you will love the Capresso CoffeTeam GS as it features Direct-Feed technology that keeps the filter holder inside the grinder. This greatly reduces the size and keeps away moisture from the beans which may affect the freshness as well as the quality of the beans. With a 6-ounce beans plate, the grinder uses solid conical burrs made from steel. They slowly grind the beans to reduce heat friction thus maintaining the aroma of the coffee. Whether you are using dark or light beans, the 5 fineness settings will still guarantee natural tasting coffee with full flavors and aroma. Remember, you can also use the machine without the grinder. Capresso included the popular Gold Tone Filter and Charcoal Filter to ensure no impurities affect the taste or smell of your coffee. The Capresso CoffeeTeam GS is among the best coffee makers with grinder. It is very easy to use and can brew up to 10 cups. Besides, it has been equipped with a program feature, LCD, intuitive control panel and so on. The price is also amazing considering the dual functionality. However, you can’t rely on it to keep your coffee hot as the carafe is not thermal. Our Rating; All factors considered, this brewer scores 4.9 stars out of 5! For a coffee enthusiast, nothing can be like when you find out you forgot to restock coffee in the house. This is why Amazon is selling this coffeemaker with the Peet’s Coffee Dash Button to help you shop for your coffee early before it gets finished. You won’t have to go through the tiring ordering process when you have the Peet’s Coffee Dash Button. The Coffee Center SS-15 delivers rich tasting coffee and can serve you solo or even a crowd courtesy of the single-serve and full pot brewing capacity. 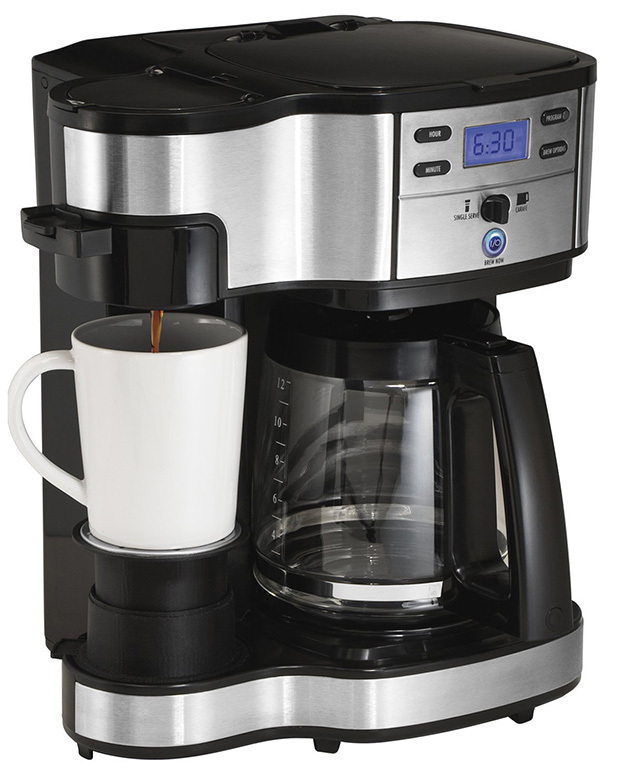 The Coffee Center SS-15 boasts a large 12-cup brewing capacity. I really liked the single serve and full pot brewing capacity. When you are alone, no need to brew a lot of coffee that you won’t finish. On the other hand, if you have visitors, you will be able to serve them all by going full pot. You can brew 12 cups, 6 oz., 8oz, or 10 oz. Cuisinart also included the HomeBarista Reusable Filter Cup that I liked using to brew a single-serve using coffee beans. The glass carafe is quite heavy and very fragile especially when washing it. It also uses a hot plate to keep coffee hot, something that sets back the coffee brewer in terms of ratings. However, in as much as I don’t like hot plates, its efficiency is quite impressive. To reduce mess on your counter, there is a drip tray that is easy to manage as opposed to coffee spilling on the counter. The Cuisinart Coffee Center SS-15 has a digital control panel with an LCD and easy control buttons. There is a Self Clean button, program, brew strength control, and the carafe temperature setting. When it comes to brewing, the Cuisinart Coffee Center SS-15 can brew both regular and bold coffee. Though it is not an SCAA certified coffee brewer, I liked how fast it was to heat the water to the perfect brewing temperatures. From the taste of its coffee, you can easily tell that the coffee beans got well showered and extraction was optimal. However, the coffee tastes great only when it is fresh. Once it stays for an hour or so, there’s this funny bitterness probably because the coffee continued to get heated even after brewing. The Cuisinart Coffee Center SS-15 with Peet’s Coffee Dash Button bundle is a great deal for coffeemakers. The brewer prepares great tasting coffee while the Dash Button gives you great shopping convenience. 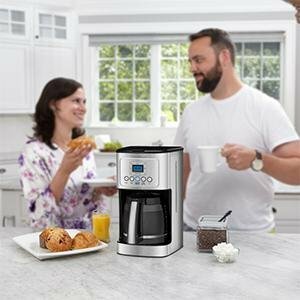 With the large capacity brewing, this coffee maker is a great purchase for a daily coffee user who hosts guests frequently. If you are the type of coffee enthusiast who likes to try out different recipes and coffee specialties, then the Ninja Coffee CFO80Z will be your perfect playmate. Personally, I like it because of its rich flavor courtesy of an excellent extraction technology. Besides, you can prepare 4 different coffee choices depending on what you like most. If you don’t like the glass carafe, you can also buy a thermal carafe. 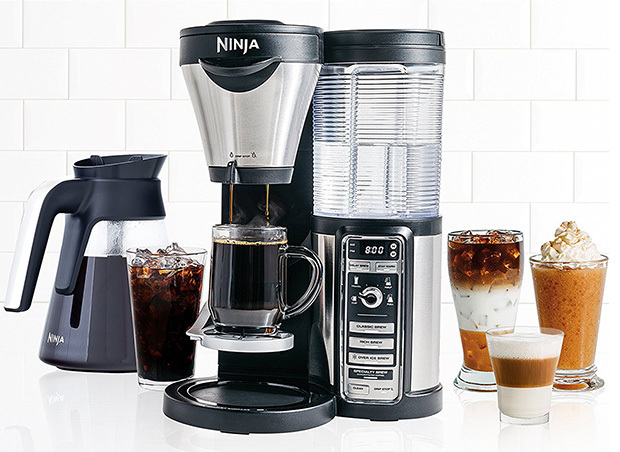 The Ninja Coffee CF080Z Bar Brewer comes with a large 8-cup glass carafe that keeps coffee hot using a hot plate that consumes a lot of energy. If you don’t like hot plates for a reason or another, you can opt for a thermal carafe that is compatible with this brewer. However, I had problems filling and washing the glass carafe as the top opening is very small. This coffee brewer has a multi-serve cup platform that allows you to brew coffee directly into your cup or travel mug. Ninja Coffee also included a 24 hours Delay Brew function that allows you to preset your preferred brewing time. There’s also the auto shutoff feature that switches the machine off after 2 hours of idling. For every purchase, Ninja Coffee includes a free recipe book with 40 different coffee recipes. This brewer has been engineered with the Thermal Flavor Extraction technology that ensures you get a rich coffee flavor out of your coffee beans. Ninja Coffee also understand the science of volume in coffee brewing and that’s where the Auto-iQ™ One Touch Intelligence comes in. It ensures the right amount of water is dispensed from the reservoir depending on the brew size you have chosen. This guarantees the best extraction which is key to the realization of a hot cup of full-flavored coffee. Perhaps the best thing I liked about this coffee brewer is the different types of coffee it brews. I was able to prepare Classic, Over-Ice, Rich, and Specialty coffee like a pro. This unit also comes with the Ninja Easy Frother that comes in handy when preparing coffeehouse-style drinks like latte, cappuccino and so on. The Ninja Coffee CF080Z Bar Brewer is a revolutionary coffee brewer that goes beyond traditional coffee brewing. It makes brewing fancy coffee types easy courtesy of the frother and recipe book. This coffee maker is ideal for those who like experimenting and trying out different coffee concoctions. Our Rating; All factors considered, this brewer scores 4.88 stars out of 5! If you brew a lot of coffee, then the Cuisinart DCC-3400 will be a great purchase for you. 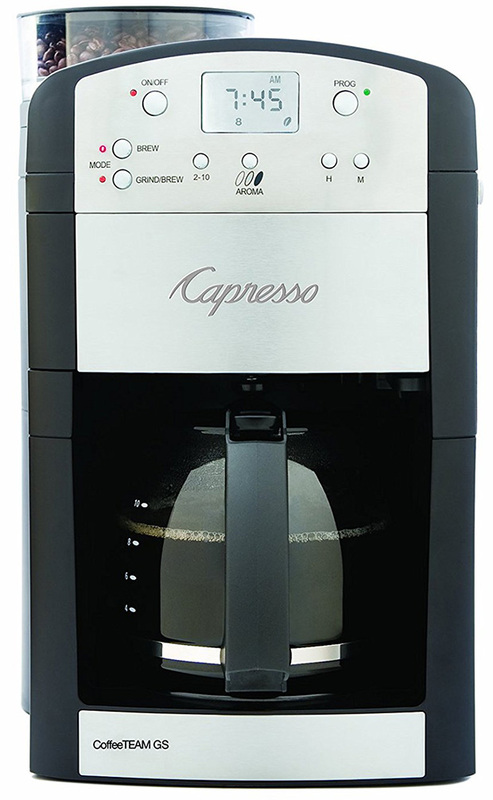 I liked the 12-cup brewing capacity which makes it a great buy for large families and offices. Besides, it has a thermal glass carafe that keeps coffee hot for hours. With a powerful heater, it brews coffee with super hot temperatures without compromising flavor or quality. Its price is also amazing considering the fact it is a top brand. The Cuisinart DCC-3400 sports a simple block design finished in stainless steel. The glass thermal carafe is very efficient and kept coffee hot 4 hours after brewing. This is what impressed me. However, the glass carafe is quite heavy and the handle is not ergonomic. Without proper care, it can easily slip and when it falls, chances are high it will break. Even though it can brew 12 cups, you can also choose to brew lesser amounts using the 1-4 cups small batch setting. However, it doesn’t support pausing before brewing is complete. For easy control, it comes with a fully digital control panel with an LCD which makes operation straightforward. There’s also an optional ready signal to alert you once brewing is complete. One amazing feature of this coffee maker is its compatibility with a grinder. You can buy it with a Burr grinder or get the grinder later on. Cuisinart built the DCC-3400 with a powerful heater that heats water to 200°F which is a favorable temperature for extraction. On the downside, however, this coffee brewer is not SCAA Certified and you can’t adjust the brewing temperature. It comes with a water charcoal filter and a reusable Gold Tone Filter to remove any impurities that may affect the flavor, smell and taste of your coffee. Actually, in terms of coffee smoothness, this coffee brewer is second to the Mr. Coffee BVMCPSTX91 OptimalBrew which has an inbuilt filter. Another thing I liked about the PerfecTemp DCC-3400 is its ability to brew coffee of different strengths. Personally, I like it bold; all I had to do is program it to brew bold coffee with the brew strength selector. The 24 hours Delay Timer enables you to preset it so that it starts brewing at your preferred times. Immediately you get out of bed, your coffee will be ready. 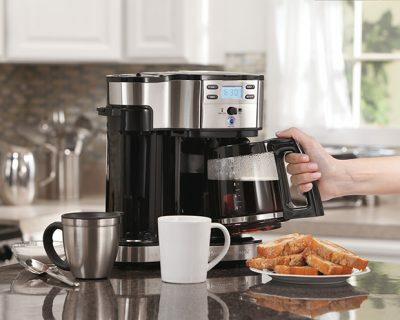 The Cuisinart PerfecTemp DCC-3400 is a great coffeemaker for large families and offices. It brews great tasting coffee and offers great convenience courtesy of its program feature. The catch is its efficient thermal carafe that will keep coffee hot for up to 4 hours making it perfect for the back to back coffee drinkers. If you are a coffee enthusiast, you know very well that not just any cup of coffee will caffeinate you; only a great tasting and a richly flavored cup will. To get the best cup of coffee, you need to have a good coffee maker, in this case, the perfect drip coffee brewer. In this segment, we will discuss several things that you need to know before buying the perfect drip coffeemaker. 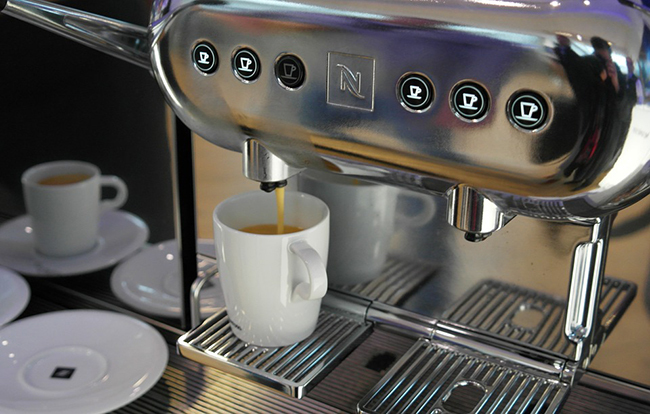 Thereafter, we will look at the factors to consider when buying these coffee machines. Why Choose a Drip Coffeemaker? I know you must be wondering why we are championing for drip coffeemakers and not any other type. The answer is pretty evident from the fact that they are the most popular type of coffeemakers in the world. If you doubt why they are the best, here are some of the main reasons why most coffee enthusiasts prefer them. Easy Usability – Drip coffeemakers come with most components assembled so you will be ready to brew your coffee in no time. Unlike the French Press, Moka Pots, and other coffeemakers, they don’t require any skills to brew good coffee. Best in class features – Coffee Brewers are engineered with the best coffee making innovations to give coffee users the power to do more. In most drip coffeemakers, you will find features like brew strength control, programmability, grinders, Auto Shutoff, LCDs, LED indicator lights, and so on. 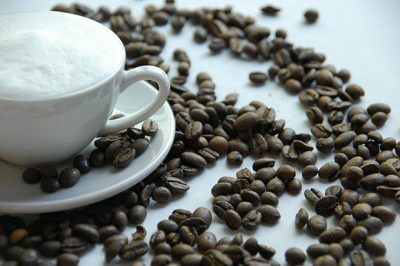 Brews More Coffee – Another advantage of drip coffeemakers is that they have a large brewing capacity. You will find them in 8 up to 14-cup capacities which is great especially if you have a large family or you normally host guests who like coffee. Even though they are made to brew a lot of coffee at once, most of them have small batch settings to prepare lesser coffee so that you don’t brew more than you need. They Keep Coffee Hot for Longer – Unlike the French Press, Percolators or Moka Pots, drip coffeemakers will not only brew the hottest of coffees, they also keep the coffee hot for long after brewing it. They come with either a hot plate or thermal carafe. No Fancy Coffee – Drip coffee makers are very rigid in terms of the type of coffee they make. If you fancy cappuccinos, espresso, latte, mocha and the rest of the fancy coffee beverages, you will not be able to prepare them with a coffee brewer. This type of coffee maker is for brewing regular coffee as we know it. There are thousands of coffee brewer models on the market each with different features. This can make choosing the perfect one very hard especially for first-time buyers. For that reason, we have decided to help you spot the best brewer by looking at several aspects. So, without further ado, here are some of the important factors you need to consider before buying any drip coffee maker. What brand are you buying from? How trusted is it? How good is its reputation? These are some of the questions that you need to ask yourself. It is very important to buy from a popular and renowned brand. Even though top brands are quite expensive, they offer top quality and reliable drip coffee makers. Also, servicing and parts are readily available. Some of the top brands you should buy from include Ninja Shark, BLACK & DECKER, Capresso, Mr. Coffee, and so on. Coffee brewers come with different capacities. You can find an 8- cup carafe as well as 14 cup carafes. When buying a drip coffeemaker, make sure it has the capacity to brew coffee depending on your quantity needs. For example, if you have a large family or an office, a 14-cup coffee brewer will be best. On the other hand, a good brewer should also have small batch setting. Remember, at times you will only be brewing coffee for yourself. In such occasions, a full pot won’t be economical. With small batch setting, you will be able to brew less amount of coffee. You need to look at several aspects of the water tank before paying for any brewer. First, are you comfortable with its capacity? If you prepare lots of coffee at one go, you will need a brewer with a large capacity water tank so that you won’t have to be refilling it every now and then. Also, is it transparent to allow you to monitor the water levels? Get a brewer with a transparent water tank or at least a water level window so that you may know when it’s time to refill it. Lastly, check whether it is detachable or not. There are brewers with detachable water tanks for easy refilling and cleaning. Others can’t be removed and this makes it hard to refill and clean. It is very important to know the type of filter your preferred coffee brewer has. Most brewers use charcoal filters for the water tank and Gold Tone Filters to sieve the brewed coffee. Here, it is important to know whether they are permanent or you will need to be replacing them. If you have to keep replacing them, check their availability so that you don’t put your brewer in the store because replacement filters are unavailable or damn expensive. Coffee is best enjoyed when hot. So, it will need a mechanism to keep it hot after brewing and that’s where the hot plates and thermal carafes come in. A coffee brewer will come with either a hot plate of thermal carafe. It is important to understand the advantages and disadvantages of both before buying any coffee maker. Hot plates are normally used in coffee makers with glass carafes. The only advantage with hot plates is that they are cheaper. They also keep coffee hot even though they are not that efficient. On the downside, they further heat the coffee, something that distorts the flavor of coffee or even makes it bitter. Also, they are not energy efficient. On the other hand, thermal carafes are double walled and insulated with stainless steel to prevent heat loss. These carafes are the most recommended because they are very efficient and can keep coffee hot for an average of 2 hours. They are also energy efficient compared to hot plates. On the downside, they are more expensive than hot plates. If you are shopping for a great drip coffee maker, get one with a thermal carafe to keep your coffee hot without compromising the flavor and quality. Even though most people ignore this factor, it is really important. It is often ignored but when you find yourself with a heavy or large brewer that can’t be carried easily or one that can’t fit on your counter, that’s when you will see the essence. Coffee brewers are available in different sizes. Before buying any drip coffee maker, carefully assess its weight and footprint size to make sure you will be comfortable moving it around. It should also be able to fit in the counter space that you have. Everyone loves convenience and so do we as coffee enthusiasts. Drip coffeemakers hare now being engineered with automated features that make coffee brewing very easy. The most enviable automated feature in coffee brewers is the program feature. There’s also auto-shutoff feature that saves energy by shutting the brewer off when it stays idle for long. Coffee brewers come with several sophisticated features that make coffee brewing really easy. Some of the top extra features you can get from these brewers include LCDs, drip stops, grinders, Pause N Serve, LED light indicators, ready notifications and so on. However, it is imperative to note that these extras will attract a few more coins to the price. So, the more the extras, the higher the price. How long is the warranty? Different brands offer varying warranty periods. When buying coffee brewers, make sure you get one with a long warranty period. You never know what could happen when using it. Typically, most coffee brewers come with 1-year warranty. However, there are others that offer even 5 years warranty. If you get one with such an extended warranty period, put in in your wish list. Price is very important when shopping for anything, drip coffee makers are no exception. Coffee brewers are available from $30 all the way to $300. The more the features, the higher the price. Also, top brands tend to sell their coffee makers at a higher price for obvious reasons; quality and reliability. When shopping for drip coffeemakers, it is important to first set your budget. Many are times people end up overspending because they didn’t set a budget. After setting a budget, it is time to do some window shopping to know what features you should expect to ensure you get value for your money. There are some very expensive coffee brewers whose price is not justifiable. Nothing can be hurting than buying a particular coffee brewer only to realize later that you could have got a better brewer with more features at the same price. A drip coffee maker is a great appliance that regular coffee enthusiast needs to own. Having one is very advantageous because you will be able to prepare your coffee any day, any time. Besides, you will be able to make quality coffee compared to what you get in most coffeehouses. This is because you are sure of the ingredients you are using. Perhaps the most worthy of advantages is that they are economical. When you look at the money you spend in coffeehouses every month versus what you will spend if you prepare your coffee at home or in the office, it is very economical to have your own brewer. Having said that, it’s time you consider getting yourself a coffee maker. If the initial investment is scaring you, please note that drip coffee makers are not as expensive as most people assume. You can get a reliable coffeemaker with less than $100. So, if you want value for money, get any of the above coffeemakers that retail within your budget and be ready to be caffeinated any day, any time!